I've recently rejoined the Society after an absence of a couple of years and, after reading some of the comments in the recent Newsletters, I felt my thoughts might be of interest, especially in view of the discussion about how the Scale and the Society should develop. S scale is apparently perceived as too difficult by many modellers. Perhaps some of my ideas might make some aspects of it a little easier? Some members may remember a short article I wrote about building a Midland Railway Clayton bogie parcel van from cardboard, (Mar 2000). I referred in the article to an Alan Gibson MR 4F kit I was going to build. Well, much later than intended, I have finally completed it and not how Alan intended. Various things about my constructional methods may be of interest, especially to those, like myself, who are not great modellers or engineers! First, a little relevant background information. Over the last few years I've spent most of my modelling time working on a 4mm (00 gauge) layout of Hellifield at the southern end of the Settle and Carlisle line. It is based as closely as possible on the real station, given the constraints of a 22' by 10' loft. The layout has been photographed by Steve Flint and is featured in the June 2002 Model Rail magazine. Now one of my pet hates is a locomotive that don't run smoothly or pull a heavy train. Much of my modelling experience has centred largely on German railways. 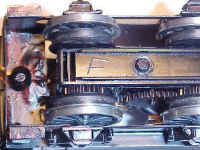 The major European manufacturers of steam locomotive models, such as Fleischmann and Roco, use tender drive mechanisms with a free running chassis. Running is always smooth and traction is almost always in excess of what is required on a home layout. For my Hellifield layout I built many kits and whilst the running of the locomotives was smooth, the locos often lacked the necessary adhesion to work heavy trains around the very tight curves I had had to use. Adding weight obviously helped, but I had a particularly difficult problem with a Patriot using a Comet chassis. No matter how I weighted the model it was always shy of tackling heavy loads. In desperation I attached an Airfix 4F tender to the loco, removed the motor and transformed the running almost to the standard of my German locomotives. Subsequently I have used numerous Airfix (now Homby) 4F, or the similar Royal Scot, tender drive units behind a variety of kit and modified propriety locomotives and always with complete satisfaction. What has this to do with S Scale, I hear you asking? Well my long-term goal is to build an S Scale Midland Railway layout using Alan Gibson locomotives. I want all my motive power to perform in a similar manner to each other and to be capable of pulling reasonable length trains. How could I achieve this, with success likely every time and relatively easily? The answer appears to lie in the use of the Airfix Royal Scot tender drive unit. They are still readily available second hand (unfortunately the model is no longer available new), often at very reasonable prices - I've bought most of mine for £25-£30. The great thing about using the Scot tender drive is that the Midland Railway tender wheel spacing in S Scale is within a couple of millimetres of the actual wheelbase of the 4mm scale tender - it's actually slightly too short but hardly noticeable (60mm compared to 62mm). To convert the tender drive to S scale, simply unscrew the keeper plate and remove the 4mm wheel sets. Next pull off the plastic wheels from the 4mm scale axles and push the geared wheel onto an S Scale axle followed by one Alan Gibson tender wheel. Then press the other 4mm wheel on to the axle followed by the second Alan Gibson wheel. Set the 4mm wheels so that they are about the same distance apart as they were on the 4mm axles, and gauge the S Scale wheels to the correct back-to-back distance. 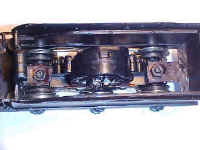 Finally pop the three converted axles back into the tender drive unit and reaffix the keeper plate. The actual drive is therefore from the 4mm scale wheels. This will no doubt appal the purists but once on the layout this subterfuge is not noticeable. The next stage is to fit pick ups to the wheels. I simply superglue some copper clad sleeper strip to either side of the motor housing, and then reinforced them with some Araldite. Finally, I soldered on some nickel silver pick up wires bearing down on all six wheel treads and connect both pick ups to the motor terminals. The result is a completely self-contained S Scale tender drive unit. To fit the drive unit into the Alan Gibson tender is simplicity itself. I cut two pieces of brass strip about Y4" by W and soldered them centrally at the ends of the tender footplate within the tender body. The next stage is to offer the tender drive unit up to these brass strips and mark the positions for the two screw holes, which Airfix used to fasten the drive unit into the Scot tender chassis. Once drilled you can use the two self-tapping screws and a couple of small washers to secure the drive unit in place. Obviously the height will need to be adjusted so that the tender sits at the correct height relative to the footplate of the locomotive itself. I found it necessary to file away a little of the plastic screw mounts on top of the drive unit and to solder some brass nuts onto the strips to act as distance spacers for the screws. Without these you won't be able to tighten the screws up tightly. To ensure that I have access to the motor unit for maintenance, I made the top of the tender complete with coal load removable. I built this out of plasticard as suggested in Alan's instructions. It simply sits on some plastic supports glued to the inside of the tender sides. To give the tender sufficient weight I've glued as much lead as possible to this removable tender top as I can cram in. Adhesion now appears to be more than sufficient for the sort of train I want it to haul. 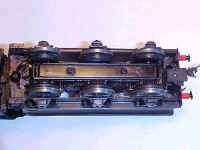 The locomotive was built exactly as intended, except that I soldered the horn blocks and bearings solidly into the frames and used Alan's EM profile wheels rather than the pure S scale ones he normally supplies with kits. I'm afraid that I find sprung horn blocks too fiddly and my eyesight is no longer up to that job! As yet I haven't fitted pick-ups on the locomotive; I probably will if only to give absolutely reliable pick-up of current. So will I use this method for future locomotive propulsion? For me, the answer has to be without a doubt. I feel that having a reliable and simple to produce drive unit makes construction of small steam locomotive models comparatively easy. In terms of cost there is no difference as a motor and gearbox will almost certainly cost the same. Hopefully, my ideas might spark others to try something similar, and of course you don't have to model the Midland to do so, as many other tenders had similar wheelbases.